This post may contain affiliate links. You may read my Disclosure Policy here. 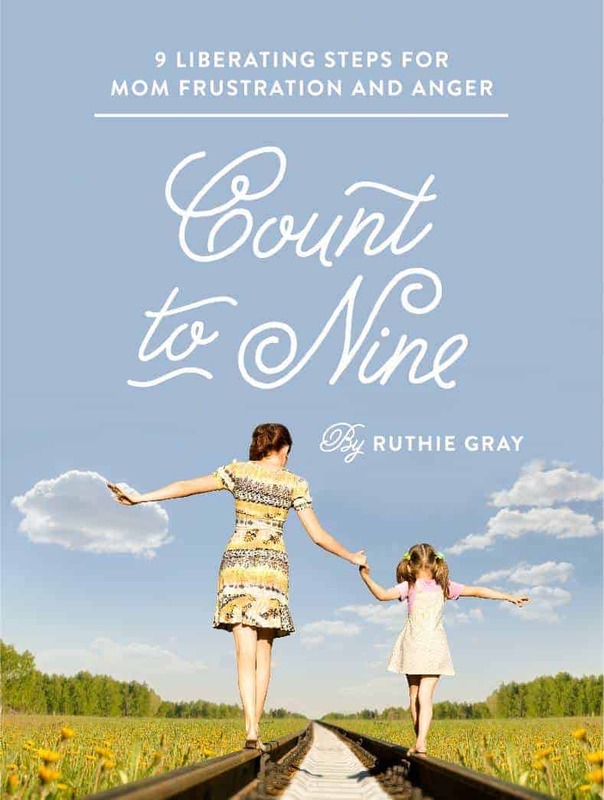 UPDATE: Congratulations to Heidi, who won Ruthie’s ebook and Bonus printables! Today I have the pleasure of interviewing a good friend of mine, Ruthie Gray. 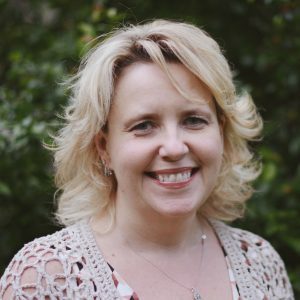 She is the author of Count to Nine: 9 Liberating Steps for Mom Anger and Frustration. 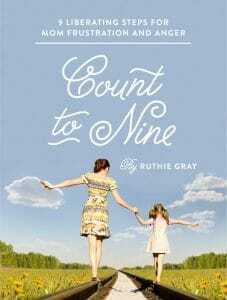 You can read my review of Ruthie’s book here. 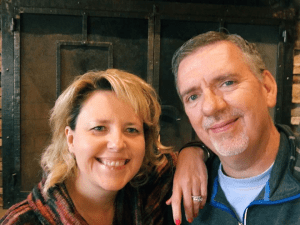 I met Ruthie in a blogging course (Christian Blogger’s Bootcamp) about a year ago. She is one of my favorite classmates! Partly, because she is amazingly funny. But also because she has successfully launched her four kids! Her wisdom has been a source of encouragement for me as the launching years for my own are closer than ever. But Ruthie also endears herself to me with her comments on my blog posts. She almost always greets me with, “Hello, CBB Buddy!” And buddies, we are. How did you meet your husband and how long have you been married? I met him in the college cafeteria just as he was about to let his buddies shove a giant spoonful of sugar into his mouth. He had an uncanny knack for making his tongue in the shape of a small bowl and thought that would be a cool thing to do. I ran the other way. However, his wit and charm eventually won me over and I’m so happy he did! 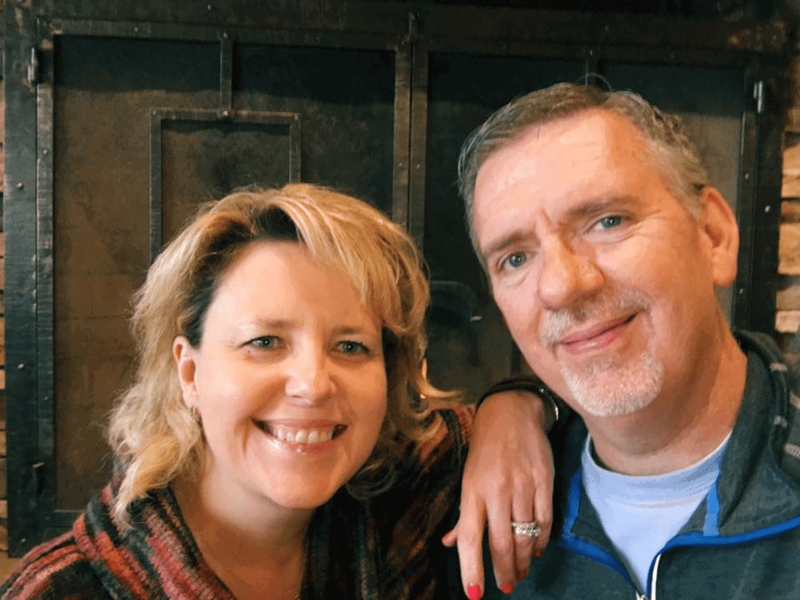 We’ve been married twenty-nine years. I still can’t believe it when I say that. That’s a LONG time! How many children do you have and what are they doing now? I’m super proud of all of them! My oldest, a girl, is married with two children, ages 2 and 4 months (The Tiny Tornado and Baby Cakes), and she is a fantastic mama! She also works part time while I babysit! My third-born just graduated college! Woot woot (Three down, one to go—there’s no more money but at least they will all have degrees!) She is back home with us (which I am super excited about), working, but will be getting married next summer! The baby is also a girl. 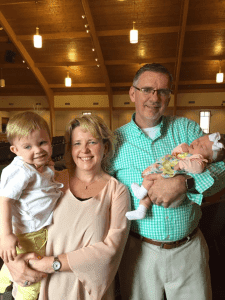 At age twenty, she is half-way through college, working at a coffee shop/climbing wall/miniature golf place, staying busy with her social life, and serving the Lord in our church as a youth leader. What do you enjoy in your free time? I love the beach! And reading! And reading on the beach! I often accompany my hubby when he travels to his home office in the gulf of Florida, so that keeps me pretty pumped! What are the top 3 things on your bucket list? Above anything else in life, I wanted to be a mom—a good mom, a successful mom who raised children to love the Lord and be responsible American citizens. I achieved that goal, and now my passion is mentoring other moms to do the same! I’m also passionate about child abuse prevention. I prayed for a long time for God to show me what I was to do with that passion and how it related to writing, because I knew He wanted me to write. MTO and COUNT TO NINE became the answers to that question. Because as we all know, child abuse happens because of anger gone wrong. God orchestrated all of that, and I am humbled to be a part of it. What got you started writing and how long have you been writing? I’ve been writing ever since I was eight years old and started my first book. It was about my mom chasing my dad “until he caught her and they lived happily ever after”! I began blogging in 2011 and felt the Lord tugging on my heart to write more passionately for moms in early 2015. Let’s just say, He’s enlarged my territory! 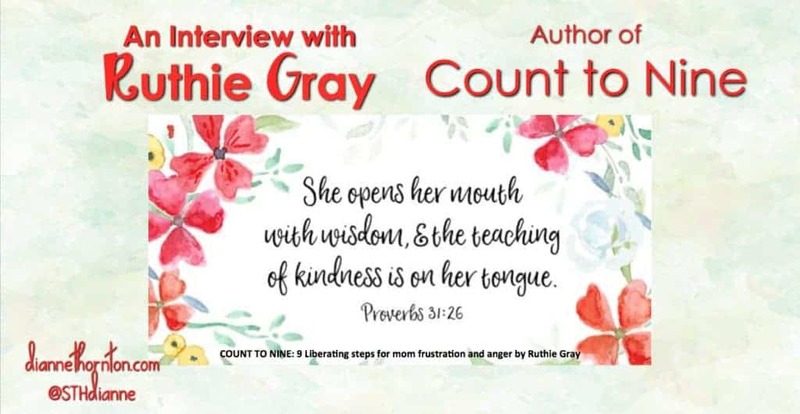 What inspired you to write Count to 9: Nine Liberating Steps to Mom Frustration and Anger? I myself struggled with anger during the child-rearing years. I yelled, screamed, and erupted all over the fam more times than I can count. I felt embarrassed and ashamed. I thought I was the only mom in the world with anger issues. These days, moms are more vocal with their struggles, which is good in a way. There is a big mom movement toward controlling anger, and when I surveyed my blog readers, they seemed to want help in that direction. I needed help in that area as well, now that I babysit the Tiny Tornado, so I did a Bible study on anger, formed a Mom Time Out group, began implementing Scripture prayers and devotionals, and the group has grown by leaps and bounds. This book is based on devotions I created for that group. Moms are finding victory in praying the Word and strength in accountability! Do you have a final word you’d like to leave with my readers? Moms, don’t stay alone in your struggle. Get help. This new book will steer you clear and true, but you must implement the strategies regularly. The strategies are Biblically based and solid. At just $7, this book is worth the cost of creating positive patterns in your attitude as well as laying those patterns down for your children. Where can my readers find your book? I’m so glad you asked! It’s on Gumroad, and here is where you can go to find it! Oh, and my amazingly creative friend Jessica designed the beautiful BONUS journal and Scripture cards from her Etsy shop! I’m so excited for you to use this additional resource! Thanks, Ruthie, for sharing your heart with us today! I know you must be thinking … I’ve got to get my hands on this book! Of course, you can hop on over to Gumroad and get yours right now. 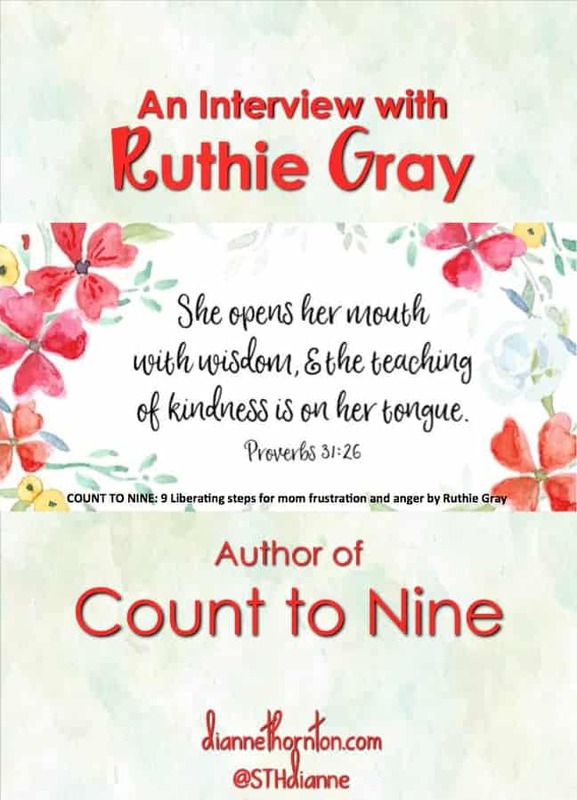 For those on my email list, Ruthie is offering a chance to win a free copy of her book along with the beautiful journal and scripture cards as a bonus. If you’re already on my email list, you’re good to go. If not, just leave your name and email address here, and you’ll be entered. You’ll receive an occasional Newsletter from me and the latest blog posts–delivered right to your inbox. In addition, you’ll receive my gift to you: A Guide to Biblical Word Studies Using Online Tools! Friday morning, I’ll put everyone’s name in a hat and have a friend of mine draw one out. I’ll notify the winner by email! Ruthie Gray is a wife, mom of four, Gigi, and caregiver, living in the sandwich generation and blogging to keep her sanity. When she’s not snacking on plastic drumsticks with her grandson (The Tiny Tornado), or snuggling his sister (Baby Cakes), you can find her coaching other moms on how to raise responsible kids and enjoy them at RearReleaseRegroup.com and Mom Time Out. You can also connect with Ruthie on Facebook. Hi! I'm Dianne! Wife to the Tim-Man and Mom to Max, Rachel, and Abby--young adults on their way to independence. God’s plan for you is to know Him and His deep love for you. He wants you to experience a fully satisfying life with Him. He alone is the Source of Life, Love, and Truth. At Sweeter than Honey, you will receive encouragement from God's Word--which always speaks to the deep needs of a woman's heart. Do you feel like no one understands you? Do you feel alone and unloved? Powerless to change your circumstances? Invest 5 days in God's Word and encounter the One Who can meet each of these needs in your life. It’s nice learning more about Ruthie. I’m with her about reading on the beach and taking an Alaskan cruise with her family. I’ve done the former but not the latter. Maybe one day. 🙂 May God continue to bless her writings! Me, too, Lisa. Nothing like being near or on the water for peace! Thanks for coming by today. This is amazing Dianne! I’ve never been exposed to so many people, Christians, that let me know it’s ok to have my meltdowns as a mom. The best thing about it is that we are being taught by the word of God. I’m so blessed to have you in my life and you inspire me in so many ways. Keep up the good work, I’m paying attention and eating up everything I can learn. Thanks again for sharing. I loved doing this interview because I loved the questions you gave! Thanks for hosting me and talking about the book (again)!! You have been more than generous in this launch, and I’m proud to count you among my faves, girlfriend. We really MUST meet someday, that’d be super cool!!! Excited to see who wins the drawing! I’ll be sharing this around the interwebs! I would love to connect with you personally! Subscribe to my newsletter to receive regular encouragement in your walk with Christ, and get instant access to your free 5-Day Bible Study. Your personal information is important to me. I will not share it with, or sell it to, anyone.